I was hoping to own this one on vinyl but the price is ridiculous. I think the suggest retail price is around $70 but I’ve also seen it priced around $100 online as well. Hey, I realize it’s a four-album set, but that’s way too much to pay, IMO. It would’ve been nice to have this album in vinyl form for the album art alone. I love the art deco style. Hopefully the price will drop on this album and I can pick it up somedya. 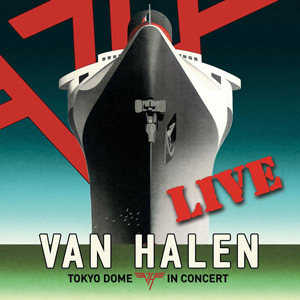 Recorded on June 21, 2013, Tokyo Dome In Concert (at times referred to as as Tokyo Dome Live In Concert) is the band’s second live album but their first with David Lee Roth. The only other previous live album was 1993’s Live: Right Here, Right Now and that one featured Sammy Hagar on vocals. From what I’ve read, there were ZERO touch-ups or overdubs done on this recording in the studio. Warts and all, this is supposedly the entire show as it was live. We’ve heard that from bands before. I always expect some touch-ups to be done. It doesn’t really bother me but I think it’d be a really cool thing if the band didn’t try to clean up anything here. There’s certainly some parts with Diamond Dave’s voice is weak but I think he does a fine job overall. Dave was never the most technically gifted singer. He’s a showman. That’s always been his draw but his voice has always fit the songs. He’s not hitting the notes perfectly, but he never could in a live setting anyway. I think he sounds just as good here as he ever did. The set list is exactly what I’d want to hear from Van Halen. All of the hits plus a few songs from A Different Kind of Truth thrown in. The new songs fit in just fine with the older material. I recently gave A Different Kind of Truth another spin and I think I like it even more than I did when it originally came out. Totally captures the classic era of VH. Tokyo Dome In Concert is a no-brainer pick up for any Van Halen fan. It’s got the songs you want to hear, Eddie is playing great, Diamond Dave’s charisma carries him through where his voice doesn’t and it’s a great concert in general. Posted on April 6, 2015, in Uncategorized. Bookmark the permalink. 3 Comments. How do the Different Kind of Truth songs go over live? I thought they fit in quite well.